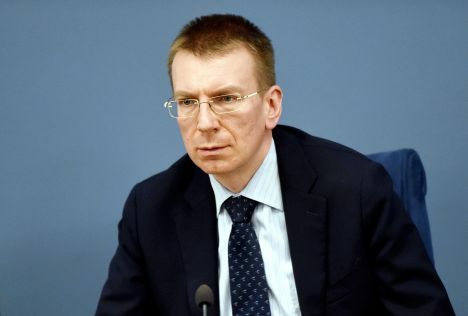 Considering the problems in the country’s finance sector, it will be necessary to work on radically changing the country’s image, says Latvian Foreign Affairs Minister Edgars Rinkēvičs. He explains that because of problems in the country’s finance sector and other problems in recent years it will be necessary to invest more to demonstrate to others that Latvia is aware of its problems and is able to resolve them. «We have a lot of work ahead of us to organize high-level meetings and events in Latvia to help resolve problems and prove that we can deal with them,» said the minister. When asked why it was important to add to the report a section on finance sector affairs, the minister said it was compiled in order to remind society that it is not just about the finance sector, credit rating and reputation matter – it is closely associated with national security affairs and cooperation with strategic partners in North America and Europe. «It was a reminder that such topics should be viewed more broadly,» adds Rinkēvičs. Commenting on what could force the government to return to this topic in next year’s report, the politician said it will depend on Latvia’s accomplishments in implementing Moneyval recommendations, as well as specific processes in ABLV Bank’s self-liquidation and improvement of the self-control mechanism. «All this is in process – the government actively works. Prime Minister Krišjānis Kariņš had previously presented ministers with specific ideas and objectives in regards to the finance sector’s control reform. I want to hope we are aware there is not a lot of time left. We are also aware it was hard to achieve compromise with different institutions in Latvia. We can see progress, but there is also the question how much progress we will have made in regards to investigation of certain cases in the near future, and this is something the foreign affairs minister cannot say for certain,» said Rinkēvičs.